Whether you're a solar owner, completely new to solar, or somewhere in between, I encourage Burleithians to join solar energy enthusiasts from across DC for the 5th annual DC Solar Congress, a free public conference on all things solar, hosted by Solar United Neighbors of D.C. The conference takes place at UDC's David A. Clarke School of Law at 4340 Connecticut Avenue NW on Saturday, April 14, 9:30 am–4 pm. Breakfast and lunch will be provided for all attendees. RSVP to attend; download the program. Throughout the day, we will have a full slate of presentations and interactive discussions. Topics will include: solar 101 information session, DC's Solar for All program, grid modernization, battery storage in the residential setting, emerging DC solar policy initiatives, ways to get involved, and much more! The event will conclude with a participatory open forum discussion for all attendees to discuss priorities and opportunities that solar supporters in DC. should focus on in the coming year. 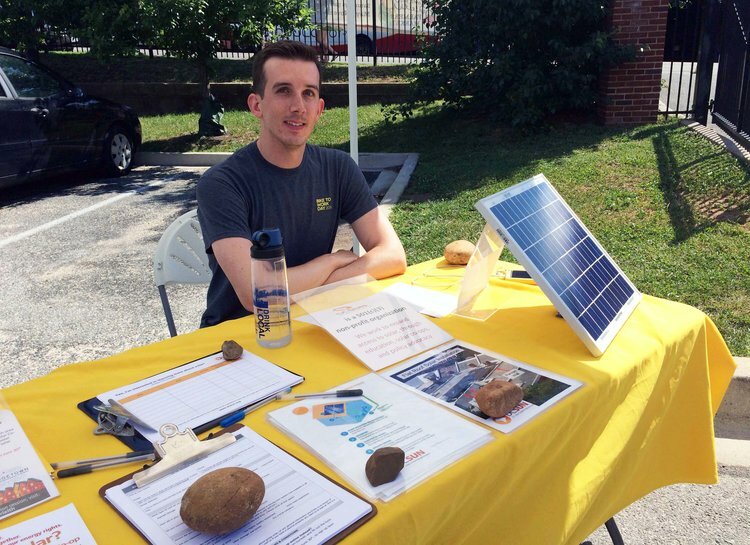 Co-op organizer Greg Miller shared info about the Georgetown-Burleith solar co-op at the farmers market last summer. Last year, as you may recall, the BCA board voted to partner with my organization on the Georgetown-Burleith co-op as part of its commitment to creating a sustainable neighborhood. Fourteen homeowners from the group (now closed to new members) went solar, joining a handful of other Burleith residents who joined an earlier co-op in Ward 2. If you're considering going solar, there's still time to join the 51st State co-op, which is open to all District residents, regardless of location or income levels. As a DOEE-funded Solar for All project, the co-op will focus on expanding access to solar for low-income households. For qualifying households, the solar array paid for by Solar United Neighbor’s Solar for All grant could reduce electric bills by 50% over the course of a year.